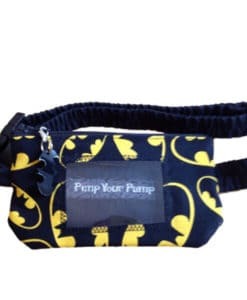 High quality 100% cotton insulin pump pouch handmade by UK brand Pimp Your Pump. This case measures approx 7.5 x 13cm and secures around the waist with a fabric covered adjustable elasticated belt which fastens with a side release buckle . The pouch has a buttonhole on the reverse to thread your cannula and tubing through and a clear vinyl screen on the front. This is high quality toughened vinyl, resistant to cracking/splitting in extremes of temperature. 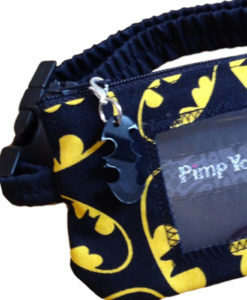 Embellished with a Bat zip charm, supplied on a lobster clasp for easy removal during washing.